German magazine shows Trump beheading Statue of Liberty, draws criticism and support from media and public. 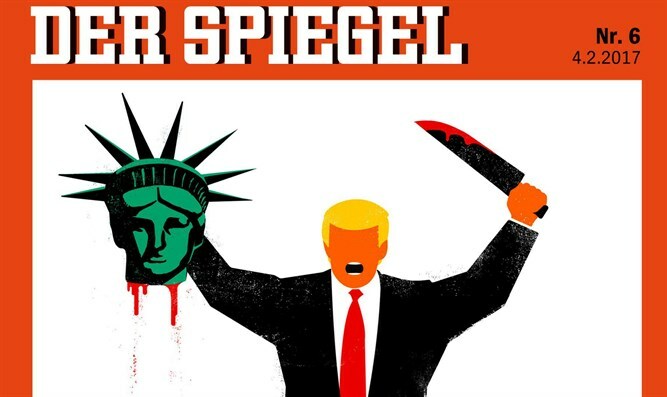 Berlin German news magazine Der Spiegel recently came under fire for publishing an image of US President Donald Trump beheading the Statue of Liberty. According to cartoonist Edel Rodriguez, who drew the cover, the picture represents "the beheading of democracy." He also said he wants to compare Trump to ISIS, since "both sides are extremists." Spiegel editor-in-chief Klaus Brinkbaeumer told dpa, "In our cover image, the American president is beheading that symbol which has welcomed migrants and refugees to the USA since 1886, and with that, democracy and freedom." Though some German media criticized the cartoon, others supported it. German European Parliament VP Alexander Graf Lambsdorff told Bild, "The cover plays on the lives of terror victims in a very nasty way" and said the cartoon was "tasteless." According to Bild, this is not the first time Der Spiegel has been accused of anti-Americanism. "During the George W. Bush presidency, it was often American interventionism that Spiegel was criticizing, while with Trump it is the end of interventionism that Spiegel is criticizing," the Bild wrote. "Are you allowed to compare Trump to the ISIS slaughterer Jihadi John?" However, the Frankfurter Allgemeine Zeitung wrote, "The Spiegel cover is exactly what Trump needs - a distorted image of him that he can make use of for his own distorted image of the press." And German daily newspaper Die Welt wrote, "This Spiegel cover devalues journalism." Meanwhile, the Washington Post said Der Spiegel's cover was "stunning."